Wesley Snipes tried to make a Black Panther movie in the 90s and he's revealed the fascinating behind-the-scenes story of this superhero adventure that never came to be. Marvel's Black Panther has a ton of buzz going for it following the world premiere, and the character is set to be one of the company's biggest heroes following the release of the Ryan Coogler directed take on the world of Wakanda. 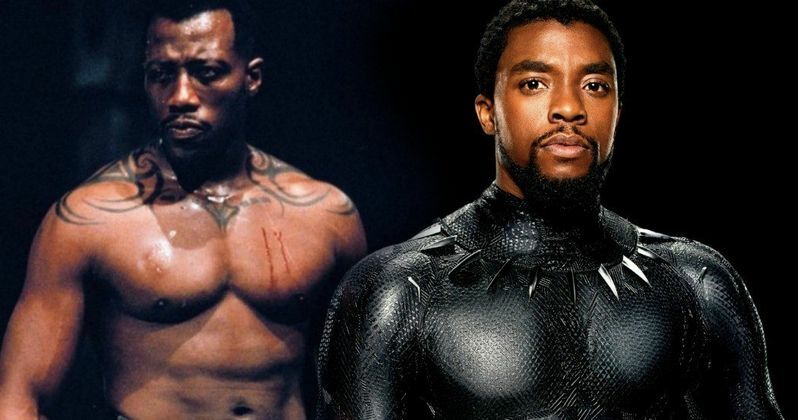 However, Snipes, who would eventually star in the Blade movies, Marvel's first actual hits at the box office, tried to make a movie based on T'Challa more than 20 years ago. Making the movie was a struggle, as Wesley Snipes tells it. At the time, it was hard to justify making a superhero movie about a character most people had never heard of. This was long before the MCU and ages before Disney would purchase Marvel and make it one of the strongest entertainment brands on the planet. Still, Snipes had a lot of excitement for the Black Panther movie that never came to be. "I think Black Panther spoke to me because he was noble, and he was the antithesis of the stereotypes presented and portrayed about Africans, African history and the great kingdoms of Africa. It had cultural significance, social significance. It was something that the black community and the white community hadn't seen before." "Our major competitor was owned by Warners, and they were coming out with Superman movies and Batman movies.... We were out there struggling.," says former Marvel editor in chief Tom DeFalco, who was around when Marvel made flops like Howard the Duck and the Dolph Lundgren Punisher movie. Columbia was to produce this Black Panther movie, which the publisher hoped would turn things around, but things were tricky from the start. "We went through three different scripts and a couple of different director options, very interesting director options at the time," Snipes says. Mario Van Peebles and John Singleton were on the list, the latter of which worked with Snipes on the hit Boyz N the Hood. However, their visions clashed quite a bit for this movie. "I laid on him my vision of the film being closer to what you see now: the whole world of Africa being a hidden, highly technically advanced society, cloaked by a force field, Vibranium. John was like, 'Nah! Hah! Hah! See, he's got the spirit of the Black Panther, but he is trying to get his son to join the [civil rights activist] organization. And he and his son have a problem, and they have some strife because he is trying to be politically correct and his son wants to be a knucklehead.' I am loosely paraphrasing our conversation. But ultimately, John wanted to take the character and put him in the civil rights movement. And I'm like, 'Dude! Where's the toys?! They are highly technically advanced, and it will be fantastic to see Africa in this light opposed to how Africa is typically portrayed.' I wanted to see the glory and the beautiful Africa. The jewel Africa.' "Thank God. I love John, but I am so glad we didn't go down that road, because that would have been the wrong thing to do with such a rich project." Terry Hayes reportedly was set up to write a draft of the screenplay and made a pitch that was rather incredible, according to Tom DeFalco. Unfortunately, that pitch wasn't enough to actually get the movie going and eventually, the project stalled and never saw the light of day. Black Panther, at the time, was a little too forward thinking, it turns out. "Ultimately, we couldn't find the right combination of script and director and, also at the time, we were so far ahead of the game in the thinking, the technology wasn't there to do what they had already created in the comic book." Following this failed movie, what many consider to be the definitive Black Panther run in the world of Marvel Comics kicked off in 1998, with writer Christopher Priest and artist Mark Texeira. Come February 16, it's likely we're going to have a definitive Black Panther movie, which sounds like it was well worth the wait. For more with Wesley Snipes on this failed movie, you can check out the full story at The Hollywood Reporter.